A millipede with a toxic gas defense. I don't often post about millipedes, because most of them are not that interesting. Harphaphe haydeniana is an exception. Harphaphe haydeniana goes by many common names. 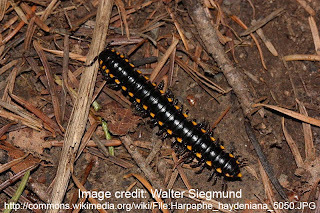 It can be called the night train millipede, the clown millipede, the yellow spotted millipede, the almond millipede or the cyanide millipede. Hopefully the picture alone will shed some light on some of these common names, others can be explained by the toxic gas they exude. When they are threatened they produce Hydrogen Cyanide gas, which is toxic to almost every living thing. This is where the name Cyanide millipede and Almond millipede comes from. Wild almonds also produce Hydrogen Cyanide gas when handled, so the two smell very similar, but the almonds are a subject for a later post. Suffice it to say that a millipede which gives off deadly gas is a pretty cool millipede. The cyanide millipede does not produce enough poison to kill a human, however if you ate a few you would be in trouble. 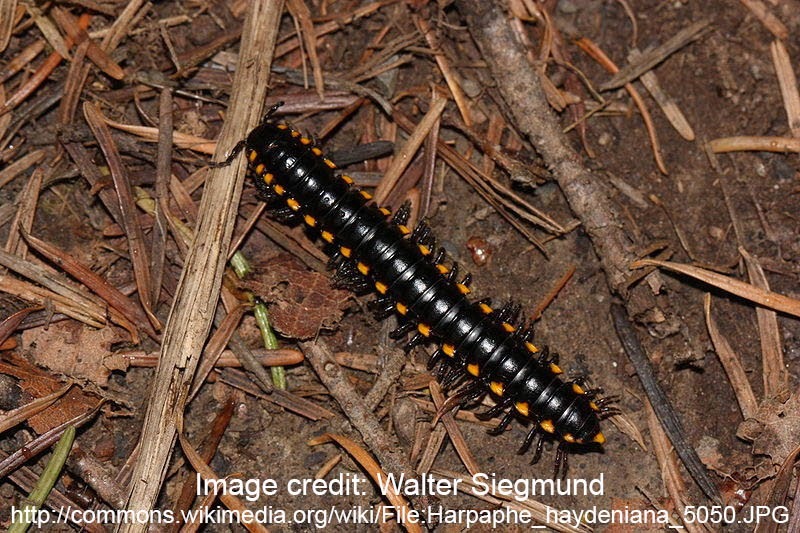 Cyanide millipedes can be found along the entire West coast of North America.